The Shaver is shown installed on the motor of a Samson Juicer. The motor is not included with the Slicer. This optional accessory for the Samson 6-1 and Samson Advanced juicers makes wonderful flavored shaved ices and slices carrots, cucumbers, radishes and many other items quickly and nicely. This Ice Shaver / Vegetable Slicer comes with all the parts necessary to attach to the Samson 6-1 or Advanced Juicer locking clip. 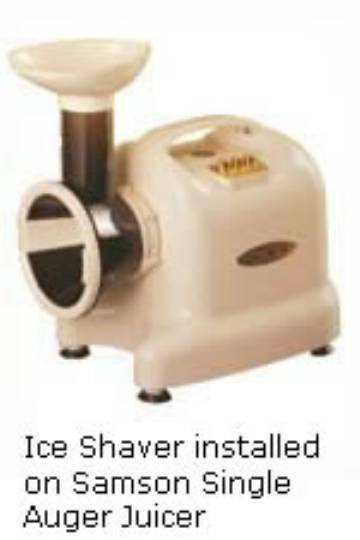 The kit includes a Drum, Hopper, Drum Blade, Ice Shaver Cap, Slicer Cap and Pusher.